We feel passionate about our eggs and think they are exquisite to taste. So much so we have had a new egg stamp made which highlights that our eggs are “Pastured”. Many consumers feel that the term “free range” has been degraded under the new guidelines of 10,000 hens per hectare and we could not agree more. To that end our eggs are stamped using our PIRSA code SA113 as well as the words “PASTURED EGGS” so our customers can be assured that our eggs are uniquely different and dare we say better than so called free range eggs. Once you have tried Adelaide Hills Pastured Eggs you will taste the difference. Fresh, nutrient dense eggs straight from our farm to your plate. 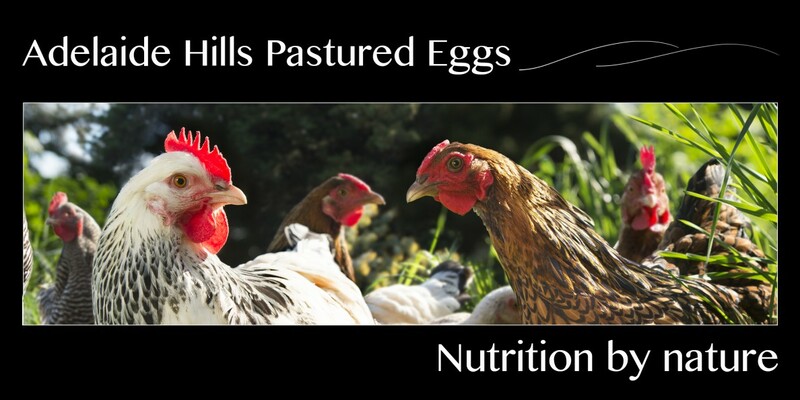 Choose the best, choose Adelaide Hills Pastured Eggs, its nutrition by nature.